Wow. It’s been a long time. This is one of the first CDs I owned. 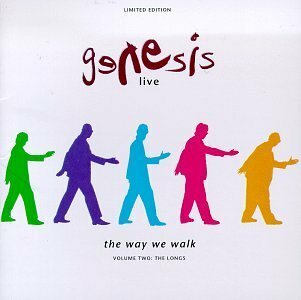 I had Genesis Live: The Way We Walk: Vol 1, The Shorts on tape, and I listened to that quite a bit. I remember it being the soundtrack to showering in late middle school and early high school (for some reason when I was growing up I used to listen to music loudly in the bathroom). Vol 1 is their modern 80s and 90s pop stuff, which I had heard on the radio at the time. I’ll admit it – as a 13-14 year old I was a big Phil Collins fan. So sue me. He was a good gateway drug to real rock music from top 40 pop, as far as I’m concerned. Vol 2 is modern interpretations of their older, more progressive rock songs, with Phil Collins now singing the parts that were originally sung by Peter Gabriel. At the time, I was totally unfamiliar with these songs (and frankly, I still am, in their original form, anyway), but I learned to love this album after repeated listens. Listening now, though, I’m glad there are not so many damn keyboards or neenery guitars these days. Or when they are used on rock songs, they’re used to entirely different effect. This album sounds so very dated. I’m sure even at the time they were a little out of fashion, given that this album was released in 1993.